Another round of updates to the OpenCycleMap cartography was released a week ago, after a few days of local testing, bug investigating and general “technical-debt” payments. The biggest fix is that I’ve finally tracked down what was causing all kinds of problems with riverbanks. 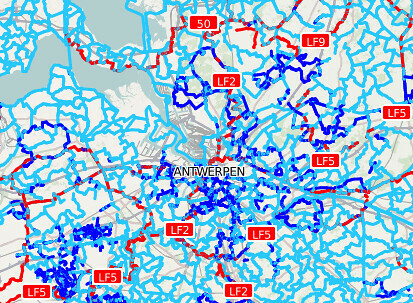 The OpenCycleMap code dates back from long in the past when the riverbank tag was first introduced, and since then it’s greatly expanded and is now heavily used in multipolygons. There was a bug with some code thinking they were linear features and other code treating them as polygons – which used to work fine, but was recently leading to giant triangles lurching across the landscape. Thankfully it turned out not to be a problem with the relation-handling code in osm2pgsql – I had enough of that last year! A major feature of this update is the map now treats points of interest – like shops, pubs and so on – equally, whether they are tagged as nodes or as areas. So in hyper-detailed places where shop nodes are being replaced by building outlines the names and icons will now show up properly. You can see some examples around Peckham where Tom Chance has been hard at work. Another ‘technical debt’ problem was regarding the “cycle node networks” widely used in the Netherlands and Belgium. When I originally tried rendering the icons at the junctions mapnik blew up – there was a bug with running ShieldSymbolizer on points. Even though this was fixed in mapnik years ago it was only last summer that I started using a new enough version, and it’s taken until now for me to reinstate (and redesign) the icons. But the new circles certainly look nicer than just numbers on the map, so it’s been worth the wait! Pedestrian areas are finally drawn properly, and cafés have been added. Bike shops get a new, clearer icon and suburbs and localities are shown. On the attention to detail front, at medium zoom levels national cycle routes are consistently prioritised over regional and local routes, and place names should behave a bit more predictably as you zoom in. And finally street labels won’t bend back on themselves so much and should therefore be easier to read. The server is chugging away at refreshing all the tiles – it’ll take a week or so to get through them all, but you can see the updates filtering through already in the most popular areas. Many thanks go to MotionX for supporting the project and this round of updates in particular, and to everyone who diligently filed bug reports and (gently) encouraged me to fix them! This entry was posted in Uncategorized and tagged OpenStreetMap on January 31, 2011 by Andy.